You should have experiments with the force sensitive resistor and photosensor to control your LEDs. You should have also used the force sensitive resistor and photosensor to control a Processing program on your computer. Congratulations! If you finish early, please use the extra time to solder some wires onto your motor, which we will be using in the near future. Using the piezo to make sound. 1. 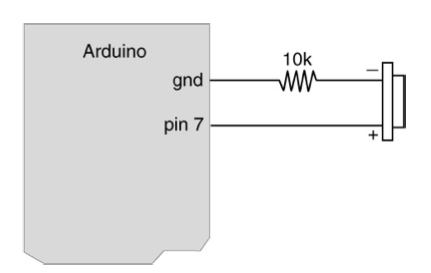 Connect the Arduino to the Piezo Buzzer. // by deleting the "/*" and "*/"
A Theremin is an instrument designed to be played without being touched. You will make one here using your piezo buzzer and the photosensor. 1. 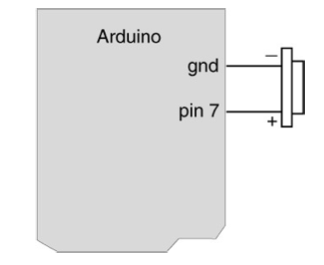 Build the Theremin circuit. 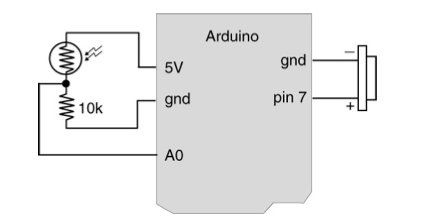 Note that this is just the photocell circuit and the piezo circuit combined. Input output coincidence exercise. Design an artifact where both input and output occur at the same place. Use any combination of your input transducers and output transducers (pot, photocell, FSR, LEDs, piezo, screen). E.g., a ball that changes colors and/or plays different sound/melody depending on the pressure being applied. A stick you can twist to color or sound differently… These are just examples to spark your imagination. Be creative!